users to register before accessing content. It's quite common these days to arrive at a web page only to be greeted by a content-hiding layer with ads or messages prompting you to perform some action before you can access the web page. 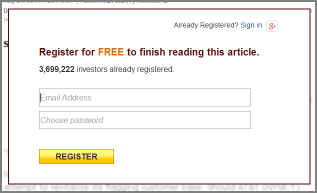 Some websites require paid subscriptions to get past their "paywall" -- these are usually difficult to bypass. 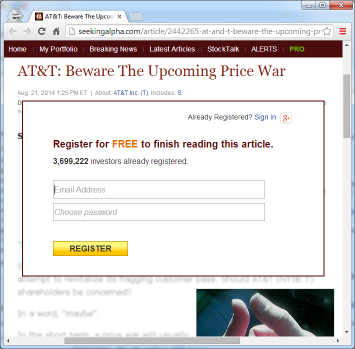 Many non-paywall sites use less sophisticated "popover" techniques to present advertisements or to prompt you for information before letting you see the web page. These are the sites that my trick often helps with. Simple adwalls work by adding a layer of content over enough of the normal web page content that you can't get to what you want to see until the adwall layer goes away. We can often get around this by simply deleting the unwanted layer. 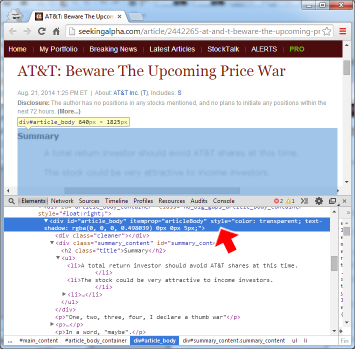 Depending on the web browser used, you can identify and delete the adwall layer with just a few mouse clicks. Hey, why not just use an "ad-blocker"? Sure, there are plenty of viable ad-blocker options you can add to your PC or web browser that can automatically help (to various degrees). Sometimes, though, installing software or web browser plugins may not an option (when using someone else's PC, using a system at the library, etc.) In those cases a manual "delete the adwall layer" method may be your best option. Here's a step-by-step example with screenshots showing a real-world case of bypassing a simple "user registration" adwall. 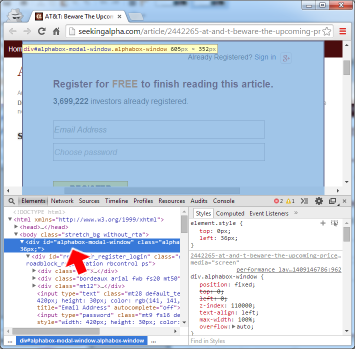 This includes an example where there is both a popover layer *and* a content-obfusication technique employed to make the web page text unreadable. We'll address both. but is stuck behind a popover "user registration" box. 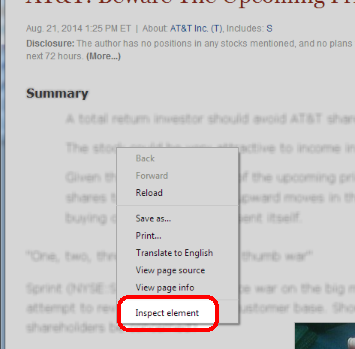 get rid of as we'll need to visually identify it again in step 3.
the offending popover box to be highlighted in blue. 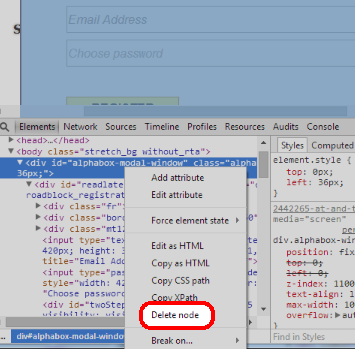 and select the "Delete node" option. Step 5: Aha! The popover box is now gone with only three mouse clicks. 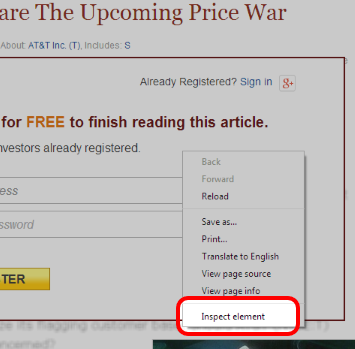 (the blurred text) and select the "Inspect element" option. 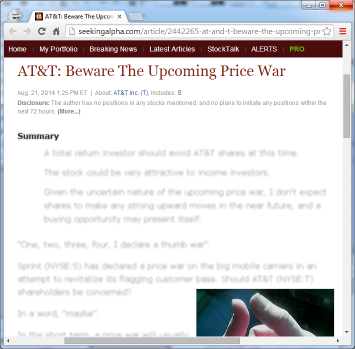 blurred text area to be highlighted in blue. 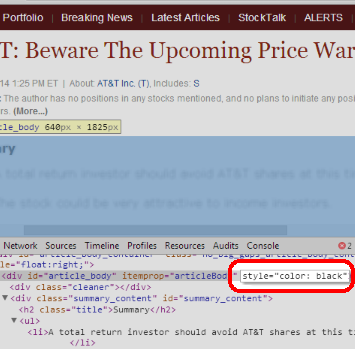 the "style" attribute and changing the contents to "color: black". screenshot) or change all the "text-shadow" values to "0". Ta-da! No more popover and no more blurred text. Total effort: 6 mouse clicks and a simple text edit. So there you are: two web browser tricks (deleting items and altering inline code) to impress your friends with. Hopefully this gives you a solid idea of how to go about bypassing simple popover layers. I probably use this technique at least once a week and am always rewarded by a small sense of satisfaction and a measure of relief when I don't have to fool with an adwall. Have any similar techniques you like to use? Please share in the comments!